I love when July comes to an end, namely because it means August is about to start and I LOVE August. Why? I think you can guess – it's the month Meghan Markle, Barack Obama, my mother and I were born. Knew it, didn't you? I'm one of those people who owns a bazillion beauty products, and only uses about 3. I become a stage-5 clinger with my beauty products. I get extremely attached and only have eyes for them. 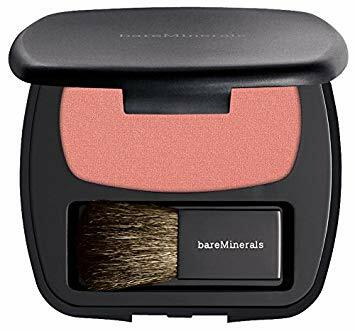 That tendency of mine is how I ended up forgetting about this Bare Minerals blush. But oh cheeses, I'm glad I had a dig around the old makeup suitcase. I don't know how I could've put this blush aside (I'm a fool, that's why) as it is colour perfection! Particularly for pasty skin like mine. We all make mistakes though, you just have to make sure you learn from them. Inspiring is one of the most overused words in the Instagram language, so I've just spent the last 10 minutes trying to find an accurate synonym to replace it so I can describe this book. (Psst! If you want to read more where this came from, check out my career girls reads 5-to-try. I started researching drugstore foundations to find more affordable options for a 5-to-try, but I've gotten completely side-tracked with this foundation and have completely forgotten to use any other. The Infallible Pro Glow is great for dry skin. It isn't too heavy but still gives good coverage, giving you a dewy look. I really do feel like a pro glow when I use it. I love quirky and unusual characters that make you feel. Doesn't matter what the feeling is – laughter, happiness, sadness, anger – just a feel. Ove is such a character. I loved this book. (Ove is literally my boyfriend in 30 years – grumpy, but dependable.) It's a quirky story, as many Scandinavian books tend to be, with some LOLs and some sad bits. As a result of reading this and loving it, I wrote a quirky books 5-to-try. Love me a quirky book. I'm sorry, but there is just no other mascara that gives such volume! Such length! Such a risky product name! It's got to be one of the best mascaras on the market. I actually got asked if I was wearing eyelash extensions while wearing it. Can you believe it! I can't. I'll be living off that compliment for weeks.